The first thing that came into my head as I read your description: Scooby Doo, Where Are You? 's A Night of Fright is No Delight. Zombies! Black magic! Murder! I loved this. Years ago I read this under it's pulp title A Grave Must Be Deep which is much more suitable for the story and perfectly lurid. Better than the prosaic title the book publishers chose. Here's the cover from the original pulp. It was serialized in six parts. A little indie publisher called Starmont printed the original serial as a facsimile back in the 80s. It was basically a photocopy of all the pages from the Argosy issues and included all the original artwork. I like this somewhat pedestrian title, but I concede your point that the lurid A Grave Must Be Deep would've been a more suitable title for this story (or The Bloodhounds of Morne Noir). No idea that this book was serialized, but explains the cliffhanger-like endings of some of the chapters. 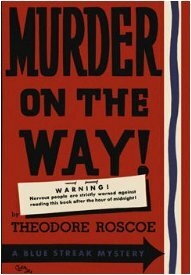 Roscoe was a very prolific writer for the pulps, especially ARGOSY, which serialized this novel. He wrote a lot of stories with Caribbean settings and quite a few about the French Foreign Legion. I corresponded briefly with him in the early 1980's when I was trying to work out Carr's connection with the pulps. I also wrote to, and became a friend of, Hugh B. Cave.